theFoodette & Family: Favorite Family Recipes-- A Virtual Recipe Swap! Favorite Family Recipes-- A Virtual Recipe Swap! Welcome to the Favorite Family Recipes Virtual Recipe Swap! It's almost Holiday time! Have you thought about what will be on your table this year? Do you have a favorite family recipe that makes an appearance every Thanksgiving? Maybe it just doesn't feel like Christmas without your Grandma's famous figgy-pudding, or Hannukah without your Uncle's crispy latkes? 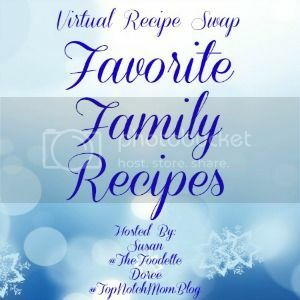 This year I am teaming up with Doree from TopNotchMom to put together a Virtual Recipe Swap! Have you ever been to a recipe swap party? I have hosted a few, and I think they're super fun! You show up with a dish and it's recipe. You chat, mingle, drink a little wine, maybe, and talk food! Everyone leaves with a different recipe than they came with to add to their recipes collections! Submit your info via this Google Form and Doree and I will assign partners. When your partners are assigned, you will receive an email from one of us with all the info. You will e-mail someone a recipe, and someone will e-mail you a recipe. You are responsible for then making, photographing, and sharing/blogging the recipe that was sent to you! No blog? No worries! Share on Facebook, Twitter, Instagram, etc. Be sure to hash-tag #FavoriteFamilyRecipes whenever you post! Please remember your manners and give all the recipe credit to the person who sent it to you! Fill out the Google Form by October 26th. E-mails will be sent with info on the 29th-30th. All posts should be scheduled for sometime between November 1st and 15th. On November 15th, there will be a linky party to showcase all you Favorite Family Recipes, please plan on joining! -1 recipe submission per person, please! The Holidays are stressful enough! -Play nice! All recipe credit shall be given to the recipe creator/sender. We're fostering friendships here, people. -Please only send your family recipes or recipes that you have created for the holidays...by this I mean, please do not copy and paste from a recipe you found on Pinterest. mmkay? -Please include the Favorite Family Recipes image found below in your post. - HAVE FUN! MAKE FRIENDS! SPREAD HOLIDAY CHEER!